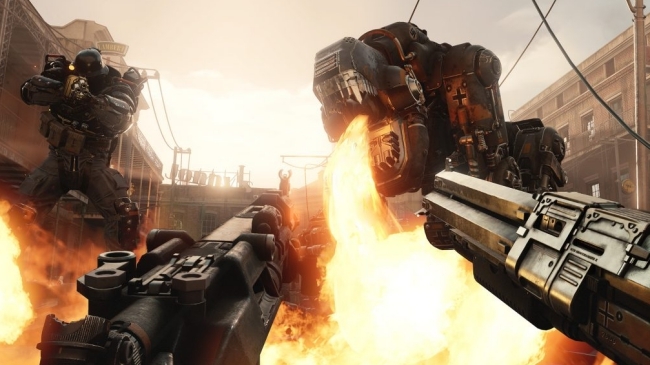 With the release date and story details for Wolfenstein: Youngblood recently surfacing, news about the VR title Wolfenstein: Cyberpilot somewhat flew under the radar. However, it also has a confirmed summer 2019 launch date. Like the Youngblood spinoff, the Cyberpilot VR experience will hit store shelves this summer on July 26th. This venture into the bizarre world of Wolfenstein is slated to release on PlayStation VR, HTC Vive, and Oculus Rift devices. The July 26th release date for Wolfenstein: Cyberpilot has been corroborated by both the Steam listing and the one that appears on the PlayStation Store. Cyberpilot’s price seems to have been confirmed, as well. According to both of the aforementioned store listings, the game’s sale price sits at $19.99 USD. Preordering the VR title on the PlayStation Network will net consumers access to a Wolfenstein: Cyberpilot Official Static Theme. Since Cyberpilot’s announcement during Bethesda’s E3 2018 showcase, very little of the game has been shown. In the game, players adopt the role of a hacker in 1980’s Paris. The primary goal is to offer aid to the French resistance, which fights back against the overpowering Nazi rule. In doing so, players must assist in taking control of the regime’s most powerful war machines. For those interested in seeing how other Bethesda-published first-person shooters transitioned to VR, it may be worth checking out Prey: Typhon Hunter, which features the TranStar VR mode. It was announced alongside Wolfenstein: Cyberpilot at E3 2018, and launched in December 2018. At its core, TranStar VR is an escape room-inspired experience with objectives and puzzles to solve. Since it takes place prior to the events of Prey, there exists narrative reasons for players to invest in it. Whether or not the same will eventually be said of Cyberpilot remains to be seen.